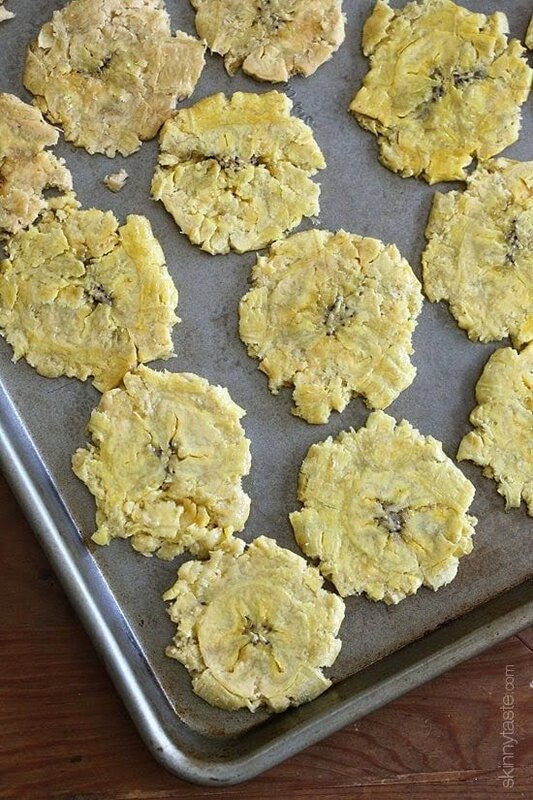 These savory plantains have been made lighter by baking instead of frying – you won’t believe how good they taste! 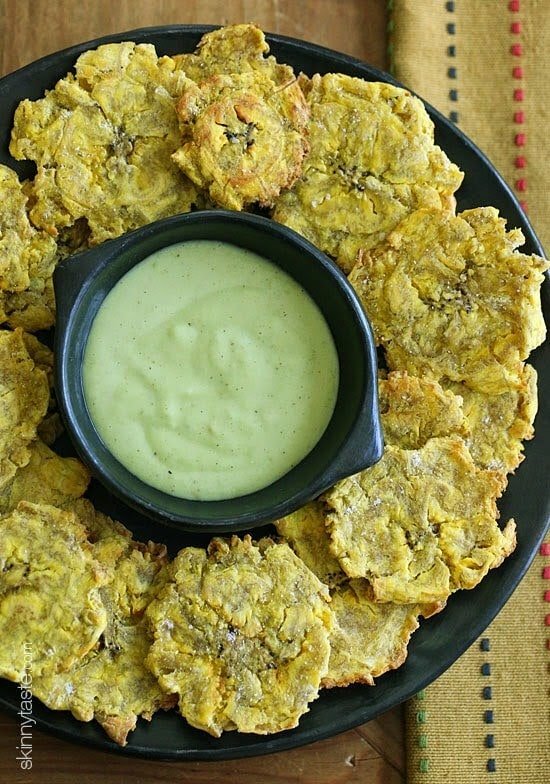 In most of the Caribbean and Latin America, twice fried green plantains called Tostones or Patacones (depending on which Latin American country you’re from) are commonly eaten as an appetizer or a side dish with any meal. They are cheap and easy to make. 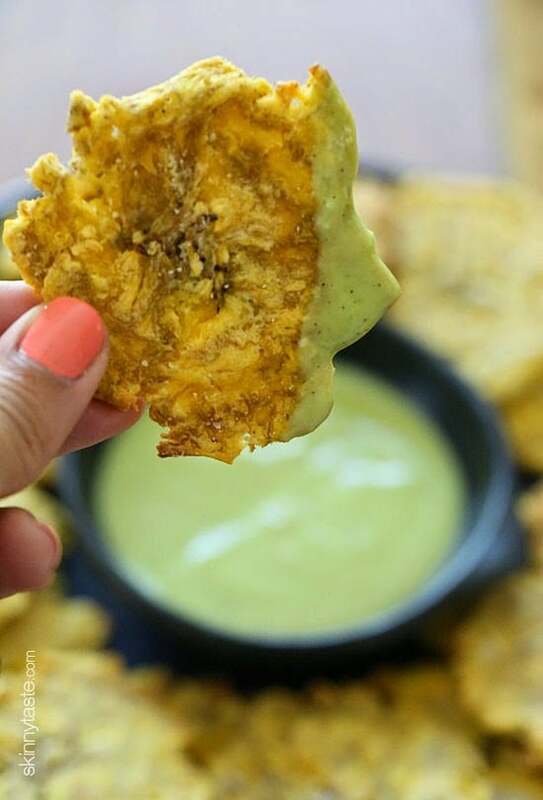 Seasoned with just a touch of salt, this has always been my favorite way to enjoy plantains. Even better, I love serving them with a dip like my Zesty avocado cilantro dressing – yum! A few years back I experimented with twice baking them, and they worked out pretty good considering they weren’t fried. Just last week I made them again and my aunt told me she always microwaves her plantains before frying them and we both wondered how that would work microwaved then baked, so we put it to the test. The results were pretty awesome, considering they weren’t deep fried, and even quicker and easier than my previous recipe. If you don’t have a microwave, you can stick with my first recipe. Later this week I will be sharing a delicious sweet plantain recipe my family makes at every backyard BBQ. Hope you enjoy these, they are naturally gluten-free, vegan, dairy-free and even Paleo friendly! Preheat the oven to 425°F. Spray a large baking sheet with oil. 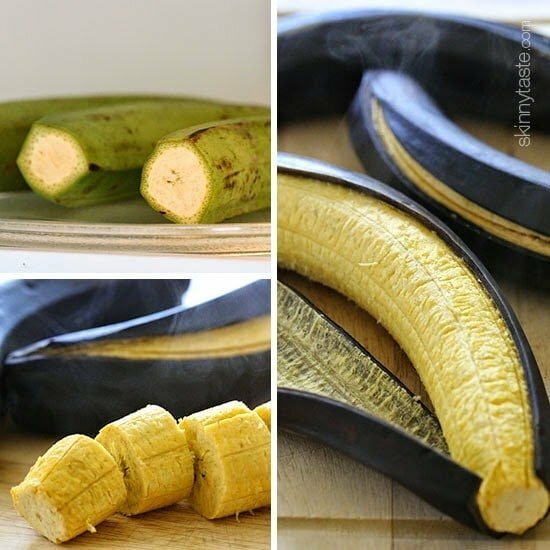 Trim the ends off the plantains. 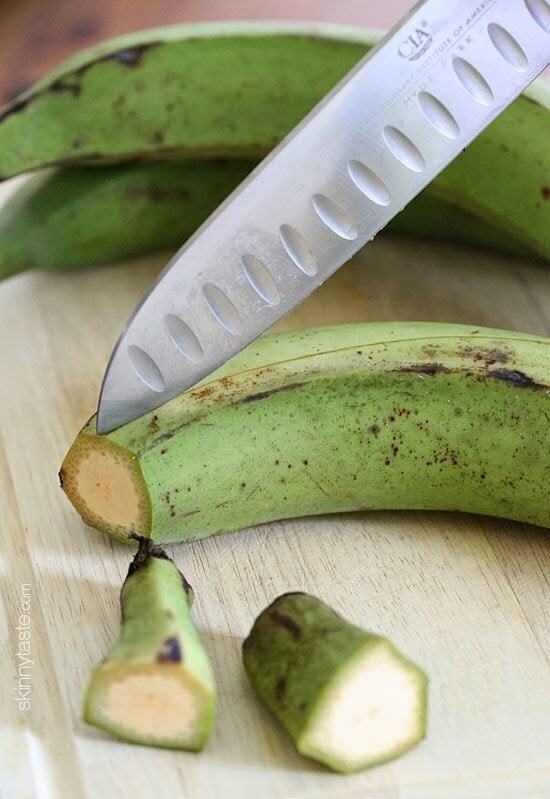 Score each plantain along two sides deep enough to cut through the skins. 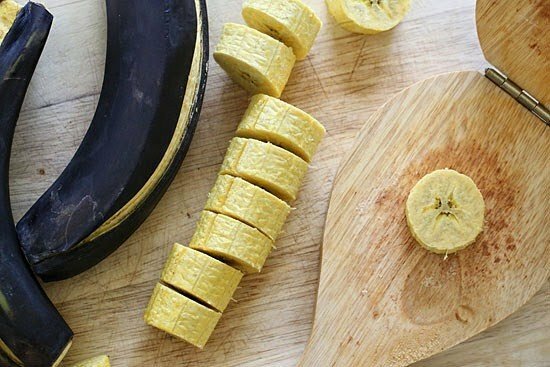 Microwave the plantains until they become soft in the center. For 2 plantains this will take about 6 to 6 1/2 minutes. For 1 plantain, about 3 to 3 1/2 minutes, depending on your microwave. The skins will become black. 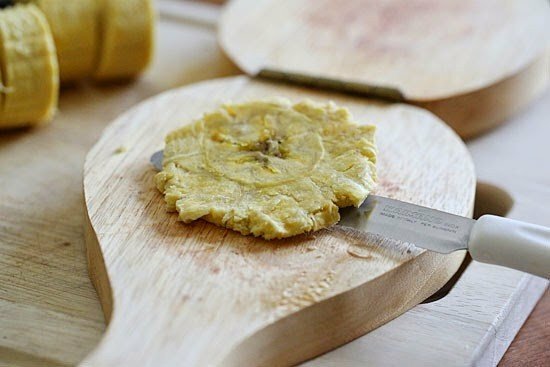 Peel the plantains and cut them into 3/4 inch thick slices while hot. You should get about 12 per plantain. 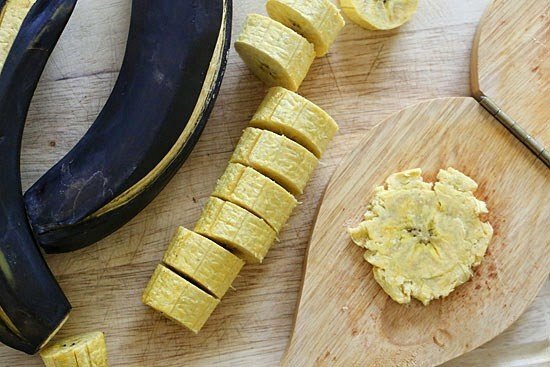 Smash the hot plantains (this needs to be done while hot) with the bottom of a jar, can or something flat. I used a tostonera commonly found in Latin Markets or you can buy a tostonera on Amazon for about $6, but anything flat will work. Place them on the prepared baking sheet and generously spray with oil, season with salt and bake until golden on the bottom, about 10 to 12 minutes. Turn and bake on the other side until golden and crisp, about 8 minutes. Season with more salt and eat right away, while hot.